For the purpose of this behaviour, it is important that your animal already understands body positioning behaviours, whether in free and/or protected contact. This foundation behaviour is needed going into the training for blood sampling. If the animal is not conditioned for body positioning, you should to consider training this first and have a strong history of behaviour. There are two important concepts we have to understand during the conditioning part of blood sampling: counter conditioning/desensitisation and duration. The second one is the biggest challenge and there are many strategies you can use. We will go through some of them to help us in reaching the goal. We will start with desensitisation, desensitisation means to teach the animal to accept, without reaction, any object, sound, light or any other changes in the environment of the animal. In this case, it can be the warm water or turnacate, the alcohol, cotton, feeling for the vain, manipulating the area, applying pressure, the needle in and out etc. There are many ways to counter condition animals for this procedure. We desensitising the animal we tend to overdue the situation because this makes the animal calmer when there is less happening. When the animal understands the idea of being calm in any situation, we start to focus more on the location we want to give the injection or take the blood sample. 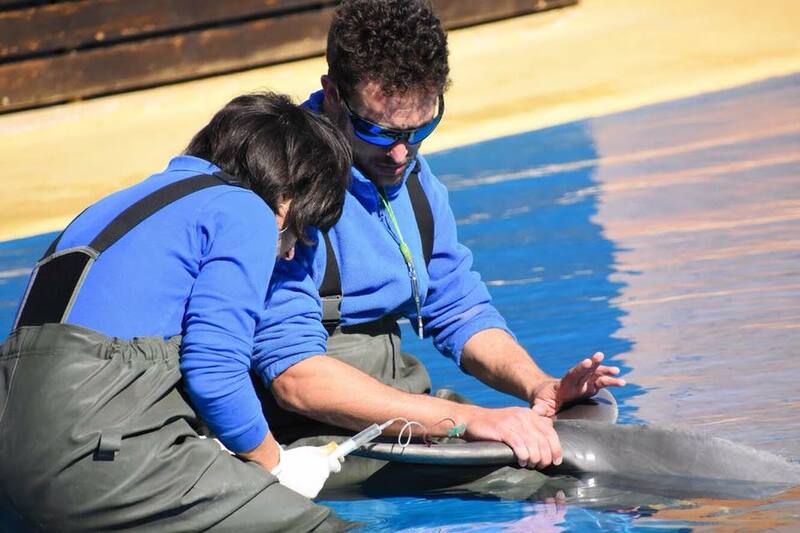 We use manipulation of the flipper, wing or tail a lot, because we want to have the perfect position for the sample or injection. When you have the animal respond calm and relax we will start introducing the procedure itself. Now duration comes in to place. Duration is the time the animal needs to stay in the body position you require for the injection or blood sample. Personally, I like to teach the animal slowly the time I require for the whole procedure. Using an encouraging signal to let the animal know they are doing well and to keep going, can actually help the procedure. If we see the animal twitch or we see that the animal has a difficult time, we can use reinforcement but no bridge. This helps the animal to still be reinforced on a particular moment you want to make stronger but not terminate the behaviour. The timing of this reinforcement should be very precise and not be the usual. When you have thought about the duration and to get that steady, you can slowly apply the rest of the desensitisation process. For applying the alcohol with the cotton, I’ve used many different textures at first. I did use mostly water at the start because alcohol itself has never been a big challenge. For the texture I used towels, plastic bags, wetsuit, sponge, paper towel or a table cloth. The idea is that the animal should relax, regardless with what I’m using to clean the area. This cleaning doesn’t have to be very long so duration is fairly easy here. Then comes the counter conditioning for the sticking, this is the moment the tricky part starts. Every place I’ve worked at I was allowed to stick the animals with a needle myself and that’s a huge advantage training this behaviour to your animals. To replicate the sticking and pressure over time I have used a lot of different objects. These items have all helped me at this stage of the behaviour. Applying a different pressure has to be taken into consideration as well. The best tip I can give you, is to always have the desensitisation trainer the same, but the reinforcing trainer can differ. The reason is simple, the trainer applying pressure and moving the part of the body around can change drastically between trainers. That’s why I suggest you have the desense person being the same all the time. There is a difference between training an animal to be used to the pressure on the skin and the sticking of the needle itself. I discovered over time, no matter how much I trained the animal to be calm, whenever I punctured the skin, I was back to where I started. Important to know is that this is ok, as long as the animal has the trust in the trainer to give the “vulnerable” body position back to the trainer. This shows you, as the trainer, that the animal still has the confidence in a potential needle sticking again. When this problem occurs, timing is incredibly important. We discovered that working your way up to the proper gage needle helped. We start with the tiniest one at the beginning and reinforce heavily for just a tiny stick; from there we built up the needle gage. This is actually the moment you will have trained an injection compared to a blood sample. When you come to a point where you find the vain, there is another challenge to consider and that is the pressure you apply to the vain. Too much pressure actually stops the vain from giving blood because you can create a vacuum. Best case is to find the spot where your tube is full within a short amount of time. Finding this area can be quite the challenge and some trainers use an ultrasound first to see where the vain is, but that’s another medical behaviour to train. 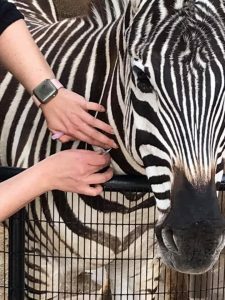 I’d like to highlight the safety consideration when training a blood sample, not just for the keepers but also the animals. The positioning is very important, but the teamwork when working with two trainers is key. Communicating with each other is one of the most important safety aspects when training a blood sample. Another important part is the antecedent arrangement. This will help you directly and you will see a positive effect within your training. It is important to keep track of your approximations because a lot is going on in a behaviour like this. The animal has to position itself, then has to stay still for a while and accept the procedure and even be relaxed after the procedure is done. This takes a lot of small approximations and timing of the trainer. I found that a blood sample has to be practised very often even if the behaviour is done already. This doesn’t mean you have to stick the animal all the time, but you practise approximations to keep the history of the behaviour strong for the goal behaviour. Previous articleShould Food Be Our “Primary” Reinforcer?